Fargo Ribbon - Silver Ribbon Cartridge, 2000 images per roll. The ribbon is used to print in one monochrome color: Silver. 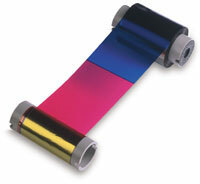 This ribbon is used to print text and one-color images one or both sides of the card. Compatible with DTC4500, DTC4500e. This part is also known as 045208. The Fargo 45208 is also known as Fargo Electronics	45208	.